As the writer of the most important source of yoga philosophy, that is Yoga Sutras, Indian holy person Patanjali describes yoga with these words: Yogah citta vritti nirodha. It means, yoga is the calming of the mind which tends to fluctuate at every single time. Because the main purpose of yoga is to understand the true nature of man, during this investigation, man needs a purified mind. Over time, different types of yoga have emerged in response to the needs of different mankind. Bhakti Yoga, Karma Yoga, Jnana Yoga, Raja Yoga and Hatha Yoga are some of them. Hatha Yoga uses techniques such as asana, pranayama, bandha, mudra, shatarma, and concentration to purify the human body and mind. The Iyengar Yoga is derived from Hatha yoga, just like any other yoga practice today. Yogacharya B.K.S Iyengar begins to learn yoga from Sri Krishnamacharya, a famous yoga guru, to regain his health impaired because of diseases like tuberculosis and typhoid in the early years of his life. Over time he develops his own technique. At the age of 94, B.K.S. Iyengar has devoted 80 years of his life to Yoga, healing thousands of people with its technique which is very strong in therapeutic practices. Iyengar method based on Patanjali’s 8-level yoga path exhibits a very detailed and sophisticated approach to the practice of asana (yoga postures) and pranayama (breath techniques). Each course is designed with practical care and is built on top of each other systematically. 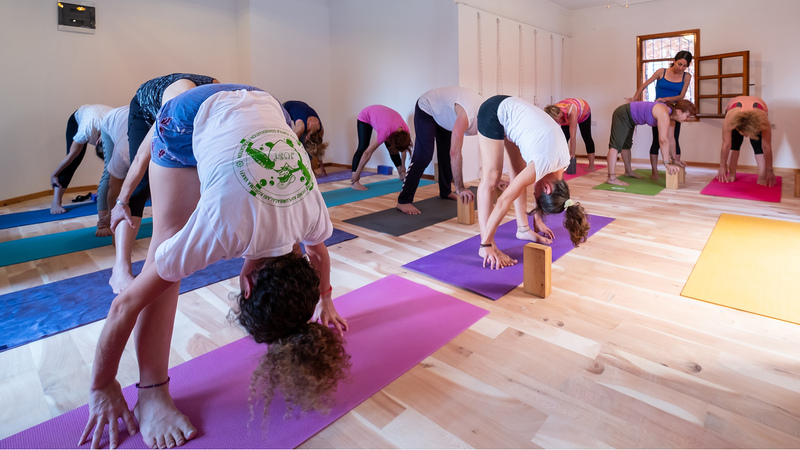 The equipment is used when necessary to make the yoga accessible by everyone of all ages and health situations. Another reason for using helping equipment is to experience asanas for a longer time in safe. The goal is to awaken the intelligence of each cell of the body. As the body gets stronger step by step, the mind flexes and the ability to focus increases. Ultimately, asana and pranayama practices are for purifying body and mind and to be prepared for meditation.